This section is about the Aston-Martin Virage, the last of the true hand-built Astons. I’ve owned one for the last 16 years or so, and have learned a lot of expensive lessons. This set of pages contains a summary of what I have learned. Just about everything interesting has been discovered by my talented brother-in-law, who lovingly looks after it in Yorkshire. Individual articles about the Virage are listed below the picture. We have more info to add on spare part availability etc, and will extend the content intermittently over time. Below is the list of current Virage pages – as we find solutions to more problems this list will extend…..
August 2018. Apologies to readers and commenters for the lack of updates and late comment approvals for the last two years. This has been brought about by the advent of our first grandchild, who we spent a great deal of time with in 2017, and a hip operation in 2018, which also laid me back a bit. In that time we amassed quite a backlog of excellent tips from G, and from readers also, and I am now starting to put these up on the site, starting with the cheapest Virage repair known to man – the radiator sensor seals. Thanks once again for your patience, and heartfelt thanks to G for his amazing work in finding solutions to Virage problems, and then providing me with notes and photos to create this website. THANK YOU so very much for Virage Corner – you have been a great help to me. Unfortunately, when it comes to brake calipers for my 91 Virage #333, I have encountered problems. The front calipers match those used on the C4 Corvettes of the same era, but for some reason the back callipers do not. I’m at a loss trying to find out which manufacturer used these calipers. The left rear caliper on my car is presently seized. I can send you photos if you’d like to see them. Thank you! Hi David- I am running chassis 50088 here in US- LHD 5 spd 6.3L widebody coupe. I changed the pneumatic hoses under the plenum after reading your site. I am currently restoring chassis 10 which was the car previously owned by the actor Rowan Atkinson. This site has been very helpful, thanks. I have a solution to the VIC problems. I have found a specialist called David Marks (www.davidmarksgarage.co.uk tel 0115 982 2030) who repairs the unit. He is able to repair the circuits, upgrade the software and replace the touch panel and back light. Not cheap but it solves the issue of the odometer losing readings. Note I am not related to the company in any way but thought I would share. I have more details of the service which if of interest happy to send you. I am posting pictures of the restoration as we go along on the twitter account @rowansvirage as the project progresses. Super information Mark, will follow up myself…. Just found your site. I am so grateful for the VIRAGE info. I have just spent 19K having engine and other repairs done including VIC unit. Engine is still not running properly. I am in the AMOc and one of our members is their historian and he told me that AM use him. Its not cheap from 3 to 5 k depending on what they find. He did a good job of mine, I must say. Hi David, I have a 1990 Virage. It idles roughly, and runs fluffy until 3000, then takes off like a jack rabbit. We have replaced plugs, leads, vacuum pipes, fuel pump, gapped the air gap at sensors to 8 though. Tested the injectors for flow and pattern I noticed a note from Peter Lawrence in Oct 19 2015 reporting a similar problem. Do you know if there is a simple cure? David Nutter . Berwick, Melbourne Vic. Australia. Tks for a great site. AND, it jumps from idle to 2800 all on it’s own. Does any body know the cause ? Hello David, I don’t know if you solve your problem but my car runs very bad since a couple of time and the symptoms were closed to yours. I décide to change the Throttle potentiometer sensor (TPS) the red PF09 from Weber. It is not aleready available new so buy the black PF09 from cycleworks. You can find it on ebay, it’s the same model for the Lancia Delta integrale and Sierra Cosworth YB. Now the rpm is normal again. Great tip Guillaume! I’ve put it on the site, on the same page as the the Water Temperature Sensor fix. I agree – just getting all my tubes replaced and it’s about £1500 to strip it all down and replace them. My central odo readout has also stopped working – I was hoping this was just a fuse, but the car has been laid up for several years, so it could be the battery mentioned on an earlier post. How do you get to this / replace it? Where did you or do you purchase the vacuum piping in the uk I live near Leeds anywhere local? I have recently purchased a 1990 Virage and find this forum very informative. Thanks. I wonder if anyone can help me with a problem I have with the Vehicle Information module (Trip computer). Its not displaying, but I’ve not been able to see how to remove it in order to diagnose the problem. Does anyone know how to do this or what the likely cause might be? Hi David and a Happy New Year. The water in fuel problem has been solved and I have successfully glued the the household black plastic gutter drainage connectors to the fuel fillers so that no water can build up in that area and go into the tank when the car is out in heavy rain and the fillers drains are blocked or cannot cope. Took the car out for a New Year run around the Lincolnshire Wolds and all was well on a sunny day. Lovely roads, lovely engine, lovely car and problem free. Enjoyed it so much that i took it out again a week later. Should have known that the Virage curse would strike again. Is this the real reason I have the car for the emotional turmoil of a love/hate relationship. When I think back to previous girlfriends it was always the ones that were the most difficult that set the heart thumping. You never quite knew where you were with them and just when you thought that it was all over they would do something fantastic and start the rollercoaster ride all over again. Those are the ones I remember the most! Set off on Sunday and this time it was not the dreaded computer, which in my case has been remarkably accurate for fuel consumption, outside temperature and trip mileage but throws a wobbly on total . This started in 2010 at 25,000 miles went up to 77,000 back to 56,000 and now sits at around 35,000. This causes much amusement at MOT time! Not the computer then which is fine but the whole instrument panel has failed. Hopefully just a relay or bad connection. The fuses all seem ok. The engine runs and all the wipers/lights/indicators work but nil information on the panel. Not even main beam or indicators warning lights or ignition, all gauges on zero. By the way do you know where to get spare parts for the air condition ? Found that by taking out the dashboard fuse and then replacing it everything comes back to life. Cleaned the terminals thoroughly, squirted Superservisol and tried different fuses but it still happens. I think that there must be a voltage surge each time I put the fuse back which stimulates some transistor to come back to life. I can live with it………just! having re-visited the site after a few months of trouble free driving, I’m now inspired to change the vacuum piping. seems a winter job. however more pressing is I think the water pump is on the way out. have you experienced this? do you know where a new one can be sourced? I assume it’s a standard parts bin raid form somewhere. keep up the good work – an inspiration! Richard – we have not yet encountered a water pump problem in our two. What makes you think it’s going? In the meantime I’ll check if the Sage has any insight. the car was overheating and popped one of the temp’ sensors in the back of the radiator. I’ve put new one in but not fully tested it, however pump now seems to be making noise which it wasn’t previously. thought i’d just change the pump until I found out how much AM want for a new one. I think a re-build may be the answer once i’m sure it’s the problem. I have since discovered the pump is unique to aston hence the price. 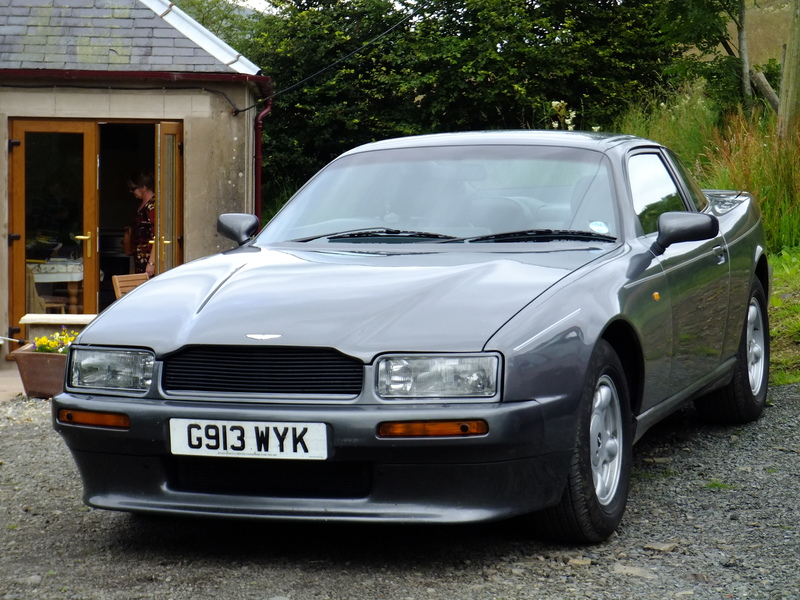 Just reporting in to say that the 1990 Virage which I fixed in October 2011 using the keyhole method, has started first time and run perfectly ever since, over fours years ago now. If I am just cruising and careful of speeding then I regularly see 23 mpg. It is a five speed manual ZF with cats removed, legal for a 1990 car. Just had an agreed price insurance quote from Byron at over 70k. Great to hear from you Jim. Mine is also running fine, although the relays have given a bit of trouble in the last few years. Fortunately they are easier to replace than the vacuum pipes! Congrats on the insuarance quote – sadly I haven’t seen that price in the market except for the 6.3s either as wide bodies, or the Vantage. But not complaining, as you say, the last classic Aston made, and still a pleasure to wheel out! Huh, I spoke too soon and tempted fate! Foolishly left it out for two days without turning off the battery and it rained. Just would not start. Turns over well with a good spark so after your experience attention to the fuel pump, or pump relays is needed I think. I will check the relays tomorrow. The tank has never been flushed out so if I find that I need a new pump I will do that at the same time. Is there a better pump that I should order if necessary? Perhaps fit another in line filter? In searching for the fault I removed the Cobra and cleaned all the terminals to no avail but now it is removed and sitting neatly next to the power steering reservoir I may as well go the whole way and remove it altogether. Could you ask your brilliant brother in law if it is only necessary to bridge the two green wires (fuel pump}on the connector or is there more to be done? Just had an amusing evening with my French neighbours who were busy translating the Cobra instructions helped by a bottle of wine! They were laughing because they said it was such a bad translation into French. A bit like trying to understand some of those Chinese English translations in some instruction manuals! Jim – sorry for the delay in seeing this – have been away for a few weeks. if you’ve left it out in the rain, I would say it is definitely water in the fuel tank. I am asking Garry about the connectors, and will post the answer here. Garry has also come up with a brilliant long-term fix to the poor design of the filler pipe. I will post that in an update to the site in a week or so. Jim – reply from my BiL: There should be two wires at the pump, black=earth and white/yellow=live feed. When switching on the ignition the pump should run to pressurise the system. It will probably only run for a limited time as the immobiliser usually cuts it off if the engine has not started. To run the pump continuously connect the white/yellow wire to the battery. To check for water in the tank you need to remove the fuel rail cover then remove the copper loop from the front of the fuel rail. Put some hose from the fuel rail into a container and switch on the ignition to run the pump. Try burning a small amount of the liquid. It should be obvious if it is water or petrol. hi David, great site – just discovered it having already worked out the water in fuel stoppage problem ! do you know where wing mirrors come from? Thanks for the nice comment – actually I don’t know about the mirrors – the external shell is certainly custom, but the insides may come from a Ford, as that was the source of many parts. ok – someone once told me and I cant remember other that I think it was some sort of citroen – oh well. my odometer is also on blink! surely there is a market for someone to solve this? David, – brilliant Informative site. And by the way, great photographs. I do howeverthink something is missing. Maybe its a “green Citroen 2CV”. Oops, said too much!!! Thanks! Is that the Denis from a long time ago in my past? In the unit is a DALLAS clockprocessor(ram-processor) of which replaced the internal battery.this battery is a lithium 3 volts one for keeping things powered when the vehicles battery goes flat.also work which is done is volt.stabiliser/buffer for txxxxxxxxxxxxxxxxxxxxxxxxxxxxxxxxxxxxxxxxxxxxxxxxxxhe voltagedrop during starting of the car so the power of the electronics keeps stabilised. Is there a possibility to repair the unit and also programming (ram-memory if lost)?is it possible i can do this job in our workshop. I read some info on a aston martin virage-forum about the infocenter problems and have done the modification of the clock-chip.it is a DALLAS1287 chip. In the forum they say to replace it for a DS12887 chip.but how about the programmation?the new one comes empty!is there a way to program it?and is this something i can do in our workshop? Hopefully you can help me with some information? Sorry for the late reply on this – the info centre is the huge unsolved problem on all Virages. On mine and J*hn’s the odometer (miles/km reading) is on the fritz, and reads random numbers. WE cannot find a source for replacement or repair. In my own car, G*rry has fitted a replacement odometer to give us at least an output for annual road tests (a legal requirement in the UK), but we are as stumped as everyone else. Hi. I have a Virage that has stopped for no apparent reason? I have changed fuel pump with no difference. I have downloaded your wiring diagram for the immobiliser, you say that you have bypassed the unit and looking at the diagram it appears that if I reinstate the ignition his should bypass it is it that simple or am I missing something altogether. Any help gratefully accepted. It’s possibly a relay problem. Check the relays under the bonnet. On cars up to chassis No.50149 they are located on the inner wings just behind the headlamps. 3 relays on the O/S, the one nearest the engine controls right hand bank injectors and master ecu, the centre relay controls the fuel pump and O/S lambda sensor, the third relay controls the air pump/air injection solenoid. 2 relays on the N/S, the one nearest the engine controls the left hand bank injectors and slave ecu, the second relay controls the fuel pump and N/S lambda sensor. Cars from chassis 50150 have three relays on each inner wing. The front O/S relay is for the slave fuel pump/lambda, the centre is for the master fuel pump/lambda. the third is for master injector/ecu. The front N/S relay is for the Auto transmission, the centre is for slave injector/ecu, the third is for the air injection. Replace each relay in turn with a new unit. Start with the fuel pump relays as both need to be OK for the pump to operate. Hi David and thanks for running an excellent site. We’ve a 1990 Virage Vin No BR 50032, which we’re putting back on the road after 5 years of inactivity. It’s just passed the MOT but perhaps predictably it was revving to 3000 rpm on cold start although we seem to have eased but not completely cured that by cleaning the inlet control valves. It’s certainly not the smoothest running engine I’ve experienced although before doing anything too drastic like the vacuum pipes I was intending to give it a decent run to see if that gets everything working again. Problem is it runs perfectly for a while but then looses all power when under load. Put it in neutral and it revs fine but put it back in gear and it coughs and splutters its way along but it remains happy on tick over even under load. Leave it for an hour or so, start her up and away she goes quite normally. Having previously taken quite a lot of water out of the boot and spare wheel well I’ll check the fuel tank and see what comes out! Could also be a relay problem if you have already checked your vacuum hoses. See the reply to Allan above. Hello David and THANK YOU for Virage Corner! Your time and effort on this site are greatly appreciated. My 91 coupe is in need of a brake job. I heard recently that DB7’s use Jaguar pads and, hopefully, other brake parts from the Jaguar parts bin. Do you know if this is fact or fiction, and if fact, does the Virage have the same brakes as the DB7? Doug – sorry for late reply. Not sure about the DB7. It’s a much later car, so I doubt the parts are the same. However, in the UK, Virage brake pads are easily available on eBay, both knockoff, and genuine Ferodo parts. Having spent over $1000 on high spec brake pads – with no particular benefit, we’ll be using the cheaper versions next time. Thanks once again for your efforts to produce and maintain Virage Corner. I appreciate it! I’m contacting you as I am shopping for brakes, rotors, callipers all ’round for Emily, my 1991 Virage. I remember reading your comment about using non-Aston parts next time and finding them on Ebay. If you know of a knock-off brand that you have had experience with, would it be possible for you to give me their name, please. Thank you David. Hi Doug, there are lots of Virage 5.3 brake pads, from quality vendors like TRW and EBC on eBay UK. G*rry says that the Virage suspension joints are XJS, and some Virages had XJS brakes also. Best way to check is to compare parts at your friendly local autoparts stockist. Engine hunting on a Virage when idling – is that something you have come across? Dodgy vacuum pipes perhaps? I would think vacuum pipes first – certainly worth replacing them if you have not already. On mine the car would idle at something like 3000 rpm rather than hunt, but it depends where the leak is. Other causes could be duff lambda sensors, although changing them has never done very much for us. Dodgy relays tend to cause rough idling or total non-starting rather than hunting, but again it’s worth changing them – along with the lambda sensors its one of the easier fixes. Cleaning the vacuum pipes is essential in our view but a long job. As a prospective new owner of a 1990 Virage your advice will make sure the car is working correctly and my £ spend is reduced. Only just saw this Neil – good luck with your Virage and thanks for the nice compliment! Hi Nick- is that your car up for auction June 1 at Greenwich CT? Looks exactly like yours…. Hello, I was wondering if all in all your virage dealings you have come across an issue where the car resets it’s odometer?? I have a 91′ manual transmission car with around 7500 miles and the odometer has reset itself to 150 miles?? I know from my browsing that this is a problem that occurs sometimes but I was wondering if you know of a possible fix to this issue? Tried disconnecting the battery for a short amount of time and it hasn’t seemed to help. Any thoughts?? Nick, funny you should mention that. We have exactly the same problem – except, my odo has on occasions gone up to 300k km (with an actual of around 50k). We have no clue this time round how to fix it. It’s a real problem for the MOT for example in the UK, and of course for insurance or resale. Don’t know if any other readers have a fix – sadly we are stumped on this one. Hi Nick- my car also reset….apparently Rikki Cann is the one shop that can deal with this…. Do you have the green on black car from Felton, Pa? Wow – that’s interesting. I’ll call them tomorow – they are on 01702 291818. Thanks for the tip Josh. Yes, thats the car! I just picked it up from a gentleman there who has owned it for an extended period of time and within the first week of owning it the odometer has reset itself…oh well, so goes life with these cars. Thanks for the tip on Rikki Cann, I will certainly look into that! Owned 1991 5 speed, now own 1991 Widebody 6.3L 5 speed. Truly an amazing machine. Mazda Miatas wet themselves when they hear it coming- and hear it they do. Hey Hans- look in Hemmings, there is a 5 speed car on 18 inch OZ wheels for sale near you….just sayin’…. I’ve seen it, but like mine better, door gaps and such are way better! Just wanted to say thanks for this information and what an excellent post. I recently put my 6.3 wide body Virage into a local garage for the vacuum pipes to be replaced and that subsequently highlighted issues with a valve of some sort seen on a Cosworth. In any event, £160 later the car runs like it has never run before and far better than it did after any visit to an Aston specialist or Aston Main Dealer workshop. First of all thanks for the nice comment and delighted that the info was helpful and that your Virage runs better now. Second, I cannot contain my jealousy that you own a 6.3 wide body, a car I have always coveted. When you want to sell it, let me know (seriously!). And finally, who did you get to replace the pipes for £160? That’s an absolute bargain and I am sure others would use this place if they knew of it.